The 82nd Airborne Division, an instrumental part of the XVIII Airborne Corps, specializes in parachute assault operations into denied areas. It was constituted at the beginning of World War 1, and played a vital part in both World Wars, as well as the Vietnam War, the Persian Gulf War, and more recently, Operation Iraqi Freedom and the Global War on Terror. 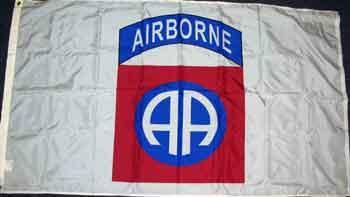 Now, you can honor these brave soldiers by flying a 3x5 nylon 82nd Airborne Flag from All Star Flags. Celebrate this century-old fighting force with a high-quality paratrooper flag featuring the 82nd Airborne C SIB. Buy the 82nd Airborne Division Flag from All Star Flags. 82nd Airborne Flag Decal - 3.25" x 5"